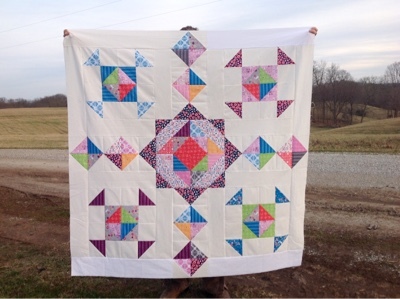 Cedar Fork Stitches: Some February Fun! First of all, I finished up a project I am super excited about! It is my first submission to a magazine! 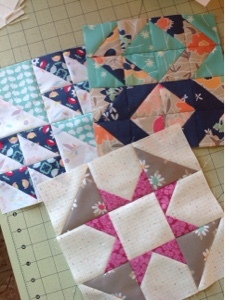 McCall's Quick Quilts! Check back in June, when I will be able to share this one in full! Secondly, I assembled my Meadow Mist Designs Mystery Quilt top! I am loving the versions with extra borders, and I think I will add a couple to mine as well! 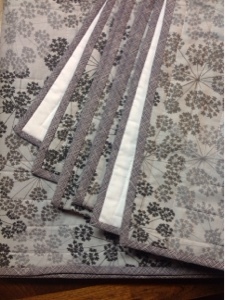 During Fall Quilt Market, I was lucky to win this bundle of Front Yard fabric by Sandra Clemons, for Michael Miller. but wanted to use them in a bigger way, on a design that has been in my notebook awhile now. So with the finish of the "magazine quilt", I jumped right on this! I had cut the pieces out in January, and didn't want to forget how they all went together by waiting too long! And it is on my FAL list, number 5, I think! 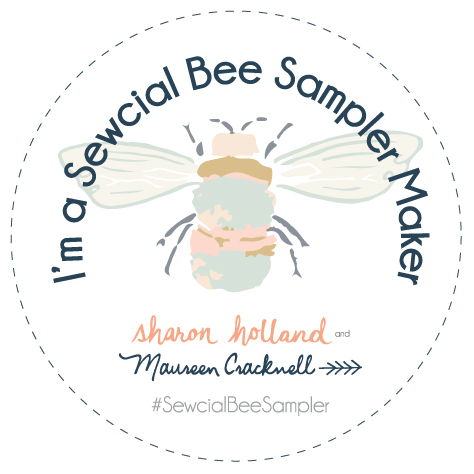 Lastly, I have joined in on the Sewcial Bee Sampler, co-hosted by Sharon Holland and Maureen Cracknell! 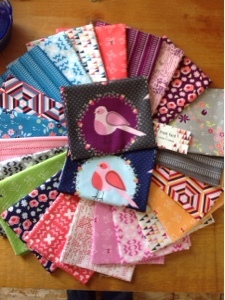 I have a small bundle of Jeni Baker's Curiosities, plus a few others that I think are appropriate for this sampler! Jeni's HST BOM, back in 2012, was the first group sewing I ever did, and laid the foundation for the love of HSTs that I obviously still have! 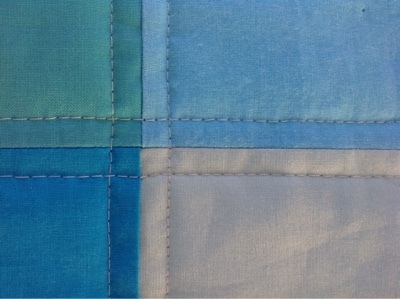 It is also remains a fave quilt in my family! Sew, that is what I have been up to of late! 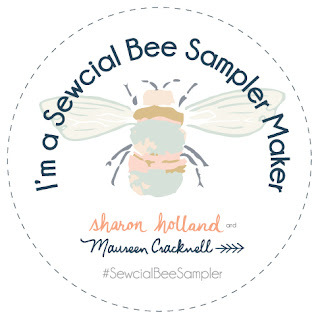 Joining the fun over at Lorna's Let's Bee Social! 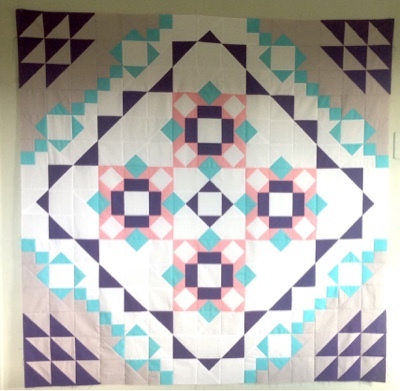 Congrats on your magazine quilt! 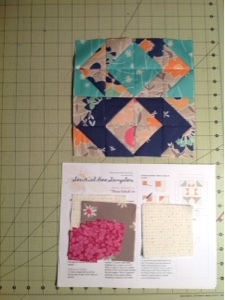 I am just wrapping up a pattern to make my first magazine submission attempt. I am very nervous. :) But, seeing others succeed and have their first patterns published is very encouraging. Congratulations on your magazine quilt! How exciting!! Your projects look great. Congrats on your publication, Sarah! I can't wait for the big reveal! You sure have managed to do a lot of sewing while moving.... Glad to see your fabric and thread are keeping you going! Good on you for submitting a pattern to a magazine! It's hard to keep it secret until it's published. You've been keeping busy with other fabulous projects though. Congratulations on winning that great bundle of fabric. Congrats on your magazine quilt! And I love your mystery quilt! Visiting from the quilt parade: Love your mystery quilt. It turned out great!